~ Food from fiction, and other things too. To be more specific, “a young girl’s coming-of-age in abject poverty in a Brooklyn slum at the turn of the century.” Though it’s more than that, too. Reading this as a teen, close to the age of main character/author expy Francie Nolan (this is one of few books I know that’s clearly autobiographical but obnoxiously pro-author), I never thought that this kind of abject poverty sounded that bad. Sure, there were some terrible conditions and events, but that was overshadowed by colorful, close-knit families and neighborhoods and lots of creative food. And Francie spends her Saturdays as an eleven-year-old much the same way I’d spent mine: hanging out with her brother, hitting up the candy store and library, spending quality hours alone with her book and peppermints, and running errands for weekend meals (Francie = day-old bread and a little ground meat, me = chocolate mousse mix and prosciutto (for my pasta recipe) from the specialty Italian store). This life comes off as idyllic, at least at the start, because this is all Francie knows. It’s the grown author, not Francie, who makes it clear she goes to bed hungry. But re-reading now, closer to the age of Francie’s mother, Katie, I see it from her perspective. It’s an intense struggle to bring up kids with practically no resources but a supportive family (drunk husband not included) and ingenuity. When you can’t afford much besides stale bread and occasional meat, you have to get creative. 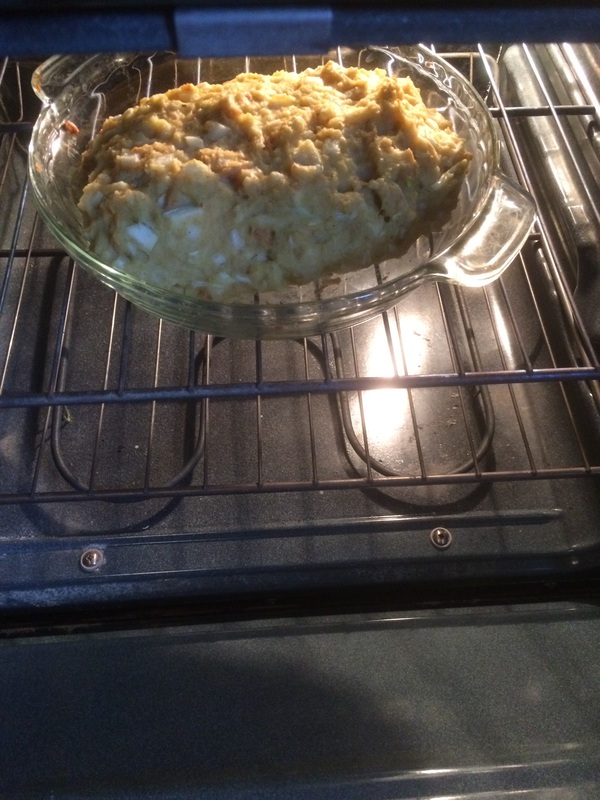 When I was younger, I wanted to recreate Katie’s family dinner staple, below. I was curious. I was excited now, to do it for the blog (even if an oven issue delayed it for a few weeks). Dear Lord, please never, ever make me have to feed this to my kids. Ever. Amen. “The Nolans practically lived on that stale bread and what amazing things Katie could make from it! 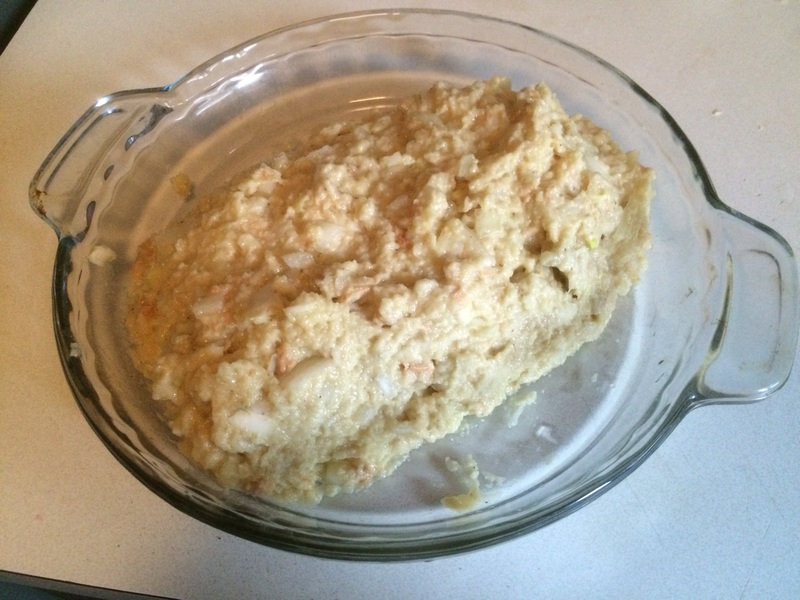 She’d take a loaf of stale bread, pour boiling water over it, work it up into a paste, flavor it with salt, pepper, thyme, minced onion and an egg (if eggs were cheap), and bake it in th eoven. 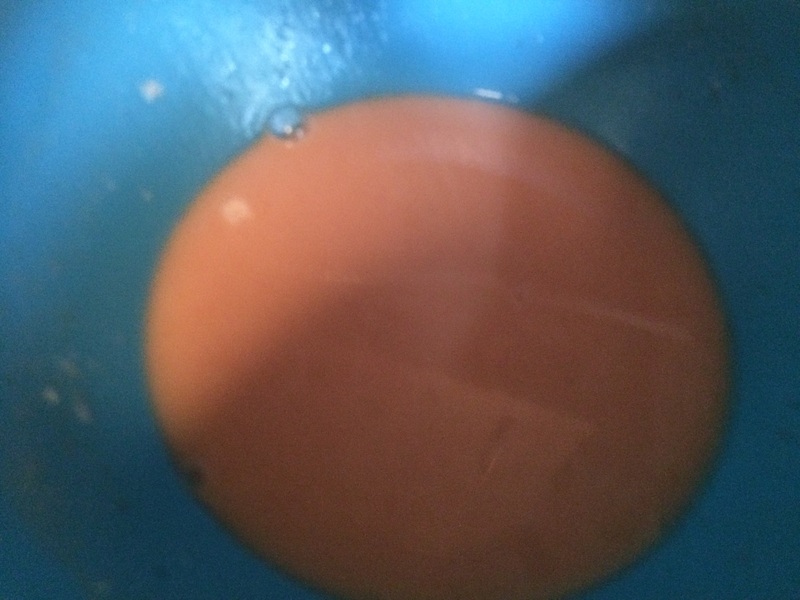 When it was good and brown, she made a sauce from half a cupt of ketchup, two cups of boiling watr, seasoning, a dash of strong coffee, thickened it with flour and poured it over the baked stuff. IT was good, hot, tasty and staying. 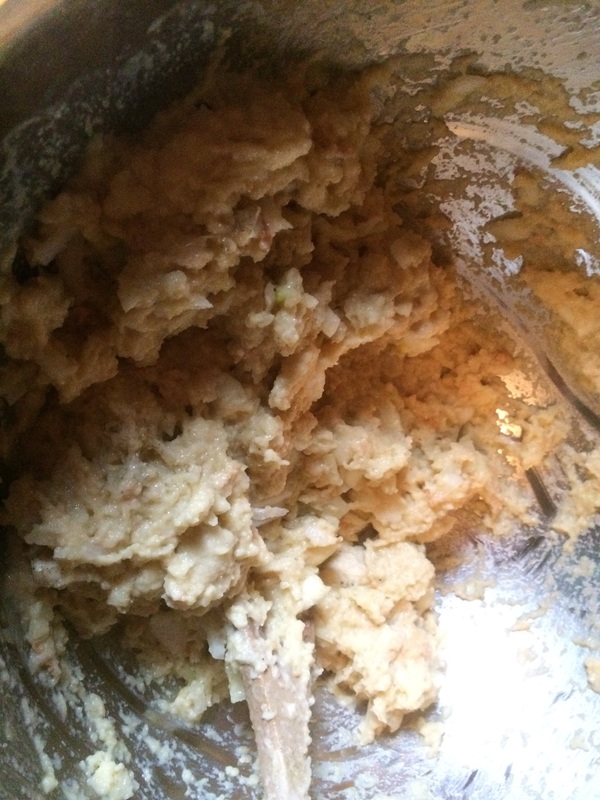 What was left over, was sliced thin the next day and fried in hot bacon fat.” (Smith 43-44). -White bread became standard in the late 1800s, so presumably Katie’s bread is white. -In the 1920s and 30s, white flour was enriched with vitamins and nutrients that people who ate like the Nolans weren’t getting otherwise. We’re in 1912, so the egg is the only source of nutrition here. -Sliced bread was invented in the late 1920s. -Now, unenriched, unsliced white bread is way more expensive and difficult to find than enriched, sliced white bread. 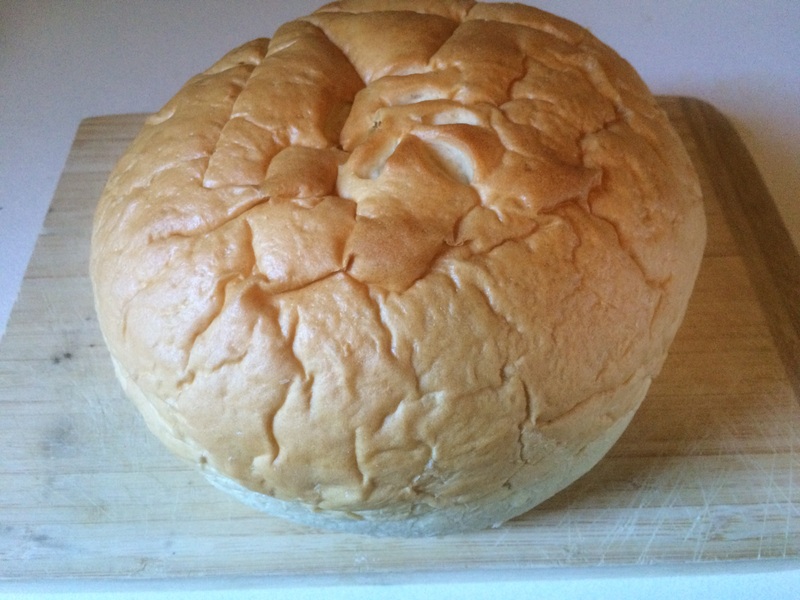 Attempting accuracy, I wound up with a 2lb bakery loaf that cost $5, pricey by today’s standard. For everything else, I went as basic as possible. -I never noticed it before, but this is basically a stuffing loaf. 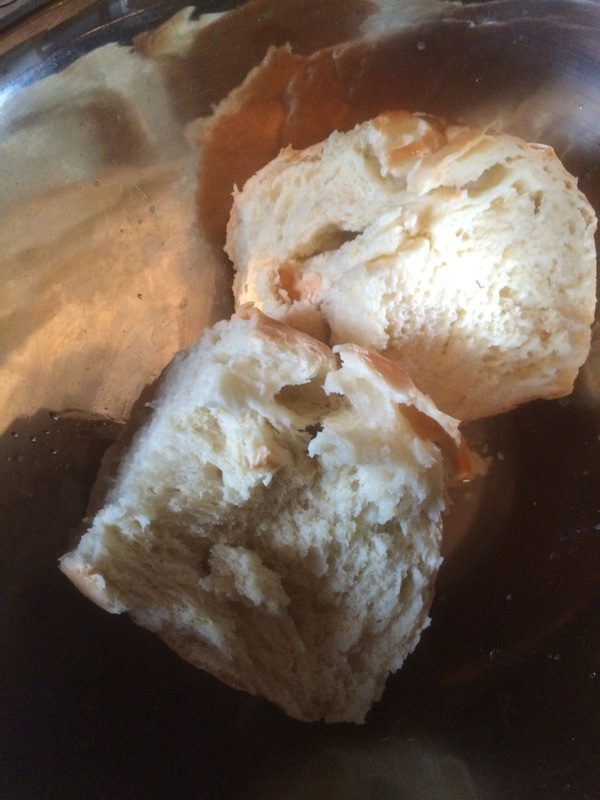 -I couldn’t find a standard weight for a 1912 loaf, but I’m assuming 1lb is closer than two. So I cut my 2 pounder in half. 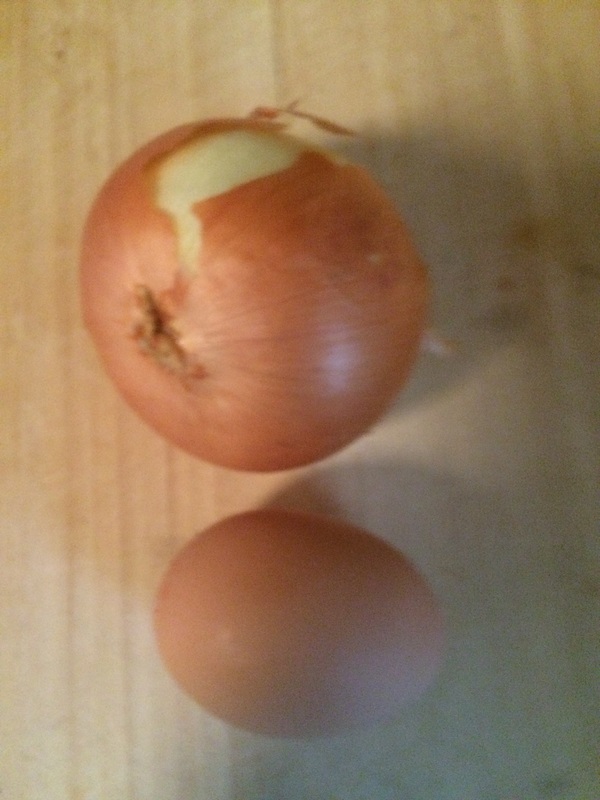 Here’s a basic yellow onion. If someone happens to know that a white onion is more on point, holler. 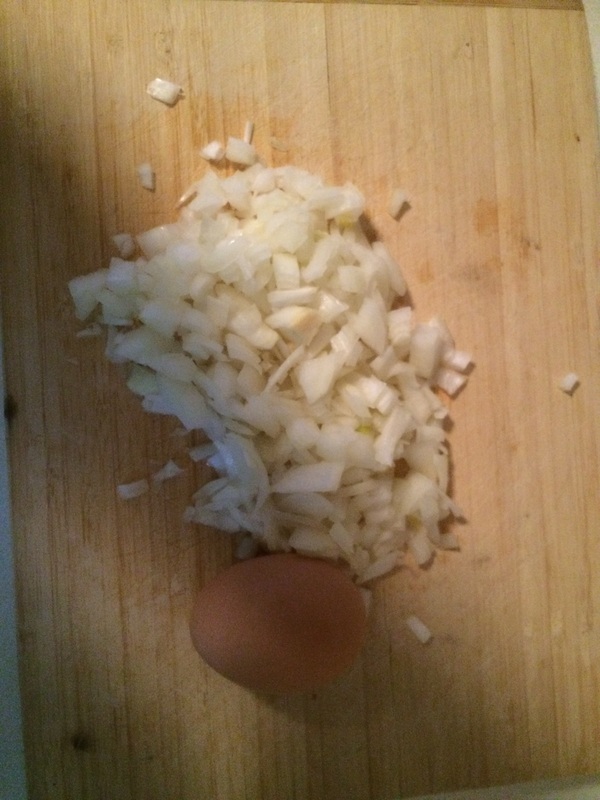 And a very informative picture of onion dicing, accompanied by basic brown egg that’s probably inaccurately large. 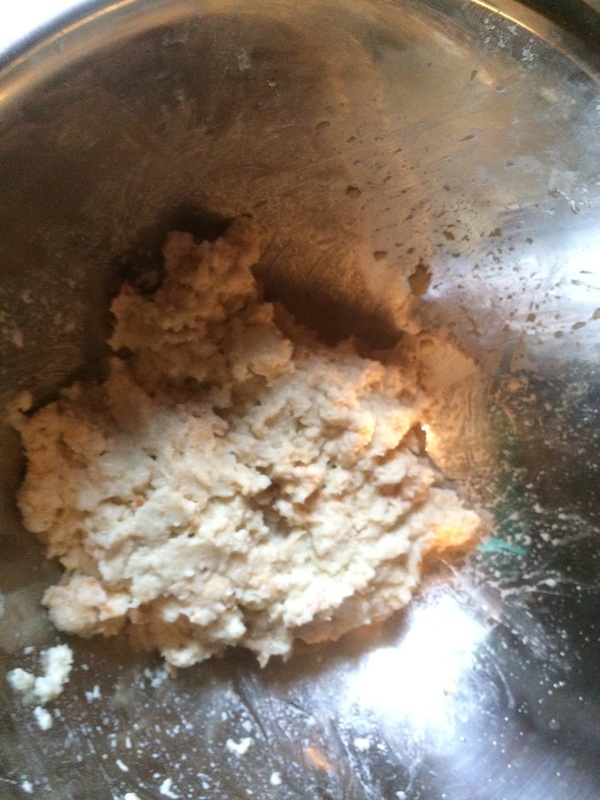 It’s surprisingly fun to mash bread into a paste with water. As with meatloaf, you’ve gotta get your fingers involved. The challenge was actually baking it. The book doesn’t tell us how, and why would it? I think at this point Katie has a gas (rather than coal) stove, whose heat will be pretty constant, but we’re advanced enough in oven technology at this point that she may be able to adjust that temperature a few different ways. I went with 350, per usual default, for intervals of 10-20 minutes. It never browned for me, though: I probably could have gone higher. Meanwhile, I’d always been intrigued by the sauce, especially the ketchup/coffee combination. I bought some Heinz ketchup in a glass bottle, then started a coffee adventure. It’s a feature of the Nolan household to always have a pot of coffee percolating on the stove. Black coffee (ground at home, stretched with chicory) is the only thing anyone can have whenever they want. It also has to be the coffee that goes into this sauce. 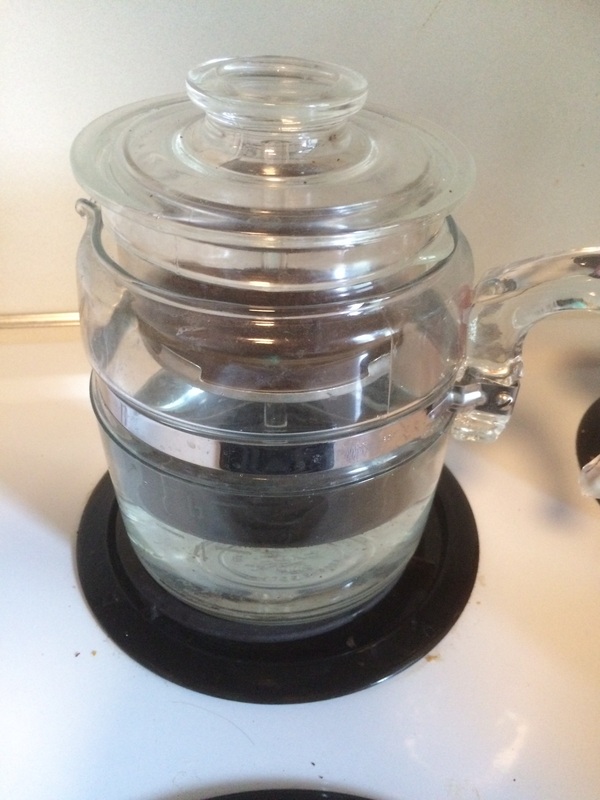 This was a good push to get out my own glass stove stop percolator again. I’d planned to have a tangent here about how mesmerizing it is to watch coffee percolate out of a stem that’s too tall for the pot (including the story about why my percolator stem is too tall for the pot), but it kind of fails without the video. Long story short, I finally went to eBay for a stem that was the right size. Also, apropos of nothing you know, my grandparents are awesome. Just admit, this is the pleasantest thing you’ve ever encountered on the blog, including Troll in Central Park and American Airlines Flight 1408. If you can imagine how it tastes, it’s all that and more. I decided the loaf was done. 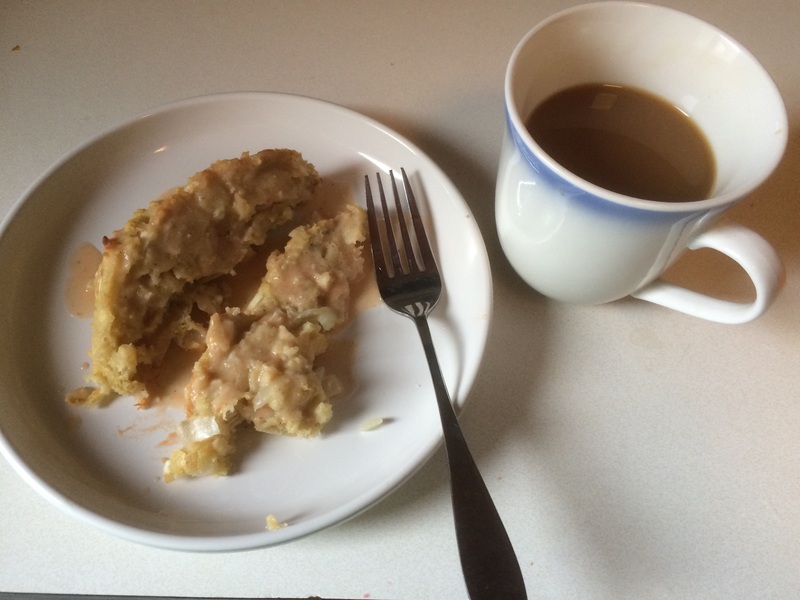 I sliced some up, poured a little sauce over it, poured the rest of the sauce down the sink, and finally poured some coffee, 1912 slum style, with condensed milk. I love condensed milk. Opening the condensed milk was my favorite part of the process. This happens to be reduced fat. If this was my kids’ dinner, it would most definitely not be. It was okay, but I was hungry again before long. 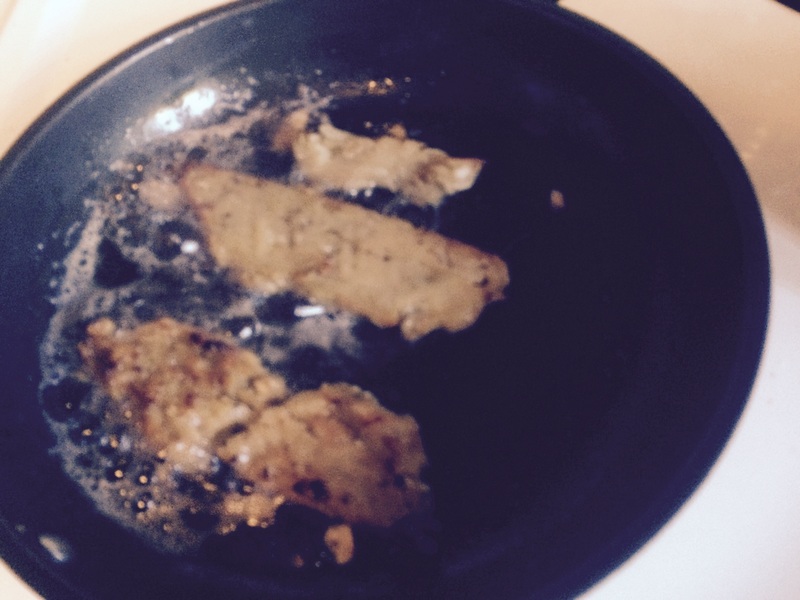 A few days later, I fried up some bacon and used the fat. I hadn’t had bacon-fried bread in years. A chunk of this went down well as a toast substitute. The rest of the loaf is still in my fridge. In the spirit of using all resources available, I’ve been meaning to cut it up and bake it for croutons. I now consider myself strongly anti-food stamp restriction. 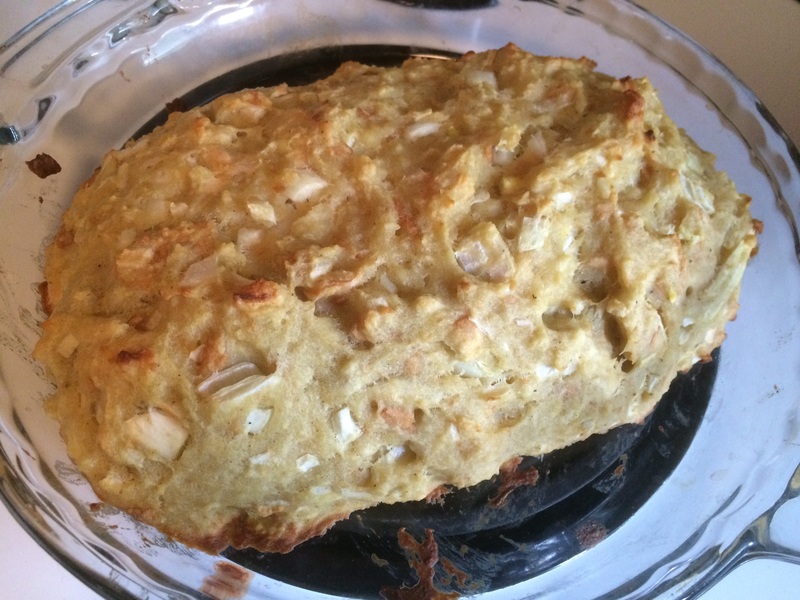 And that’s (very sadly) not a coconut cake.